We all love food, don’t we? Especially the ones which come with large doses of titbits that make our taste buds dance. But there is one annoying thing that comes along with our delicacies. Yes, you got it right. Calories! You want a nutritious meal that gives you a rush of energy. And you want to satisfy your taste buds too. It appears you have been in quest of this combo since the dawn of mankind, but just could never get your hands on it. Well, fret not! The wait is finally over. 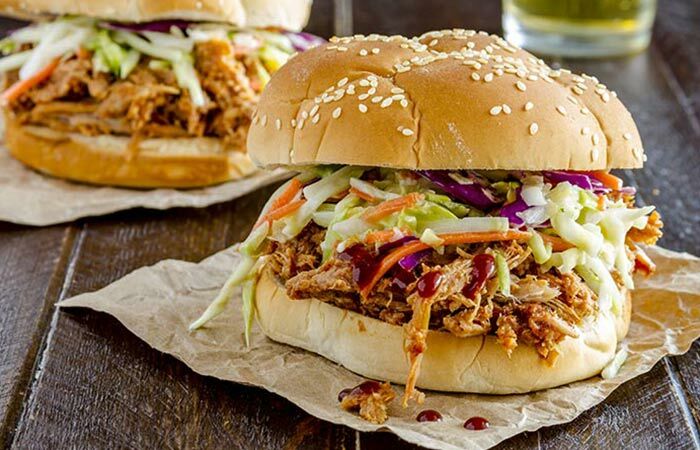 We understand you, and that’s why we have come up with 69 Low Calorie Lunch recipes that are both super-nutritional and delicious. And guess what? They are no more than 400 calories each. 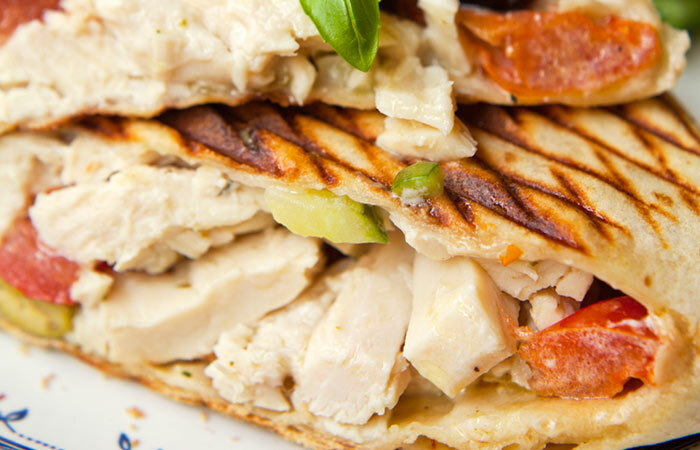 1 wheat pita stuffed with 1/2 cup of chopped chicken breast, 1/2 grated apple and 1 teaspoon of low-fat Greek yogurt. Low-fat Greek yogurt is one of the best sources of calcium and vitamin D! 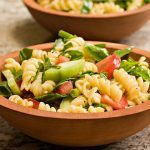 2 stalks celery, chopped; 1/2 cup chopped green bell pepper; 1/2 cup chopped red bell pepper; 1/2 cup chopped yellow bell pepper; 1 pint grape tomatoes, halved; 1/2 cup chopped green onion; 1 (16-ounce) bottle Italian-style salad dressing; 1/2 cup grated Parmesan. 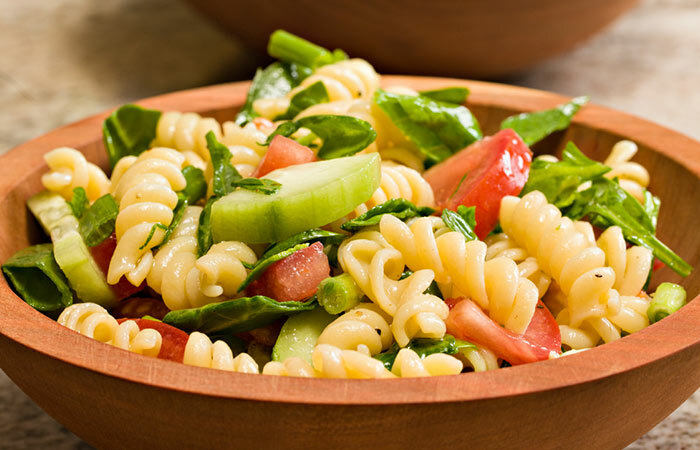 Whole wheat pasta is rich in complex carbohydrates and fiber! 1 tablespoon olive oil (plus extra for drizzling), ½ finely chopped onion, 1 teaspoon smoked paprika (plus a little extra), 1 small peeled and diced sweet potato, 140 grams of red lentils, 3 thyme sprigs (leaves chopped), 500 ml low sodium vegetable stock, 1 teaspoon red wine vinegar, pitta bread and vegetable sticks to serve. Olive oil is beneficial in curing Diabetes and Obesity. 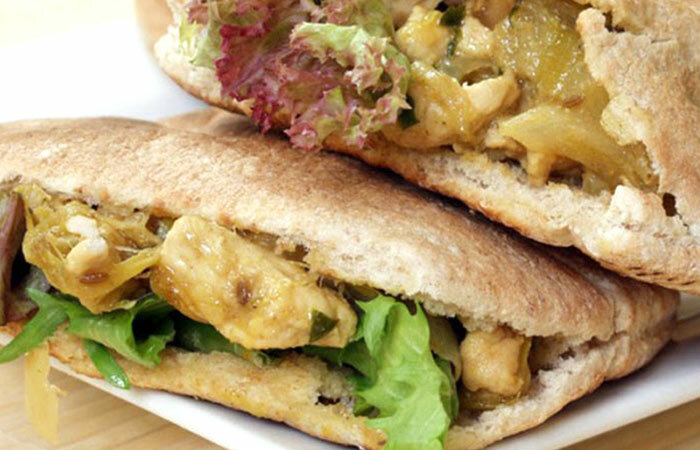 Pitta bread is high in carbohydrates and protein and very low in fat. 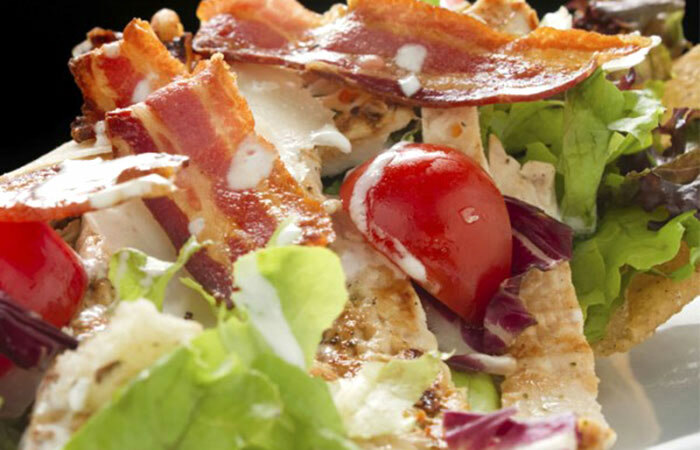 2 slices deli turkey, 1 cup grape tomatoes, 1 slice crumbled bacon, 2 cups of chopped iceberg lettuce tossed in 1 tablespoon low-fat mayo. Lettuce is a whole life food and is an awesome food rich in protein and Omega 3 fatty acids. Whole-wheat tortillas are rich in fiber, iron, and folic acid. They help cure diabetes. 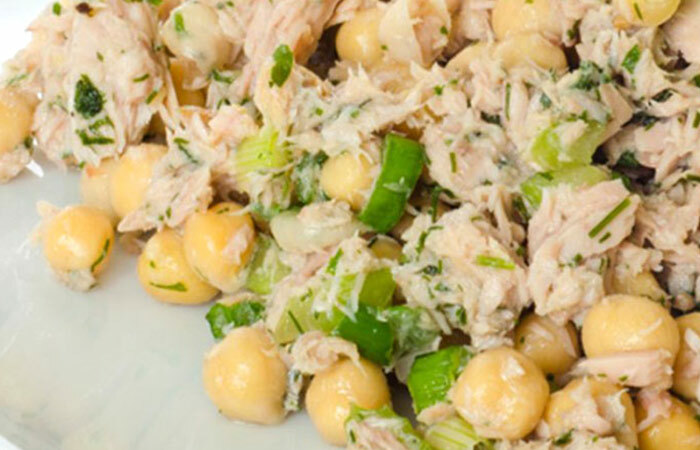 3 ounces olive oil packed light tuna with ½ cup chickpeas and cayenne over 2 cups chopped romaine lettuce. 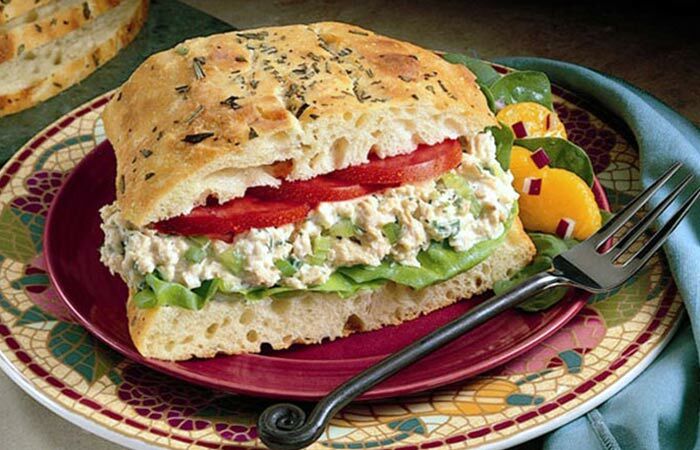 Tuna contains Omega 3 fatty acids and is also a rich source of proteins! 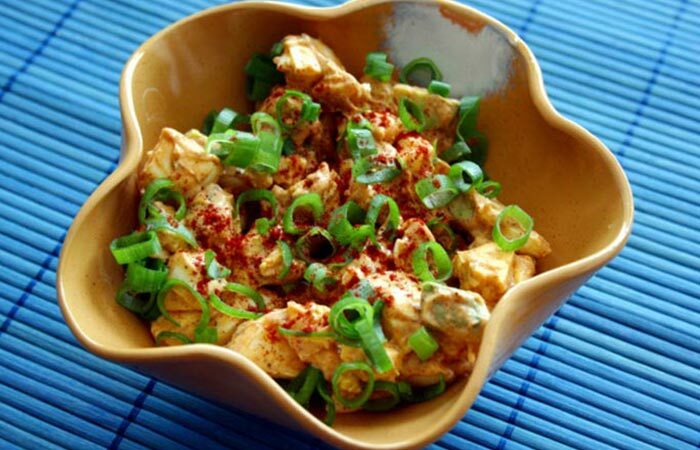 2 hard boiled eggs, 2 tablespoons low-fat Greek yogurt, 1 tablespoon hot curry powder. Serve with 3 papadums. 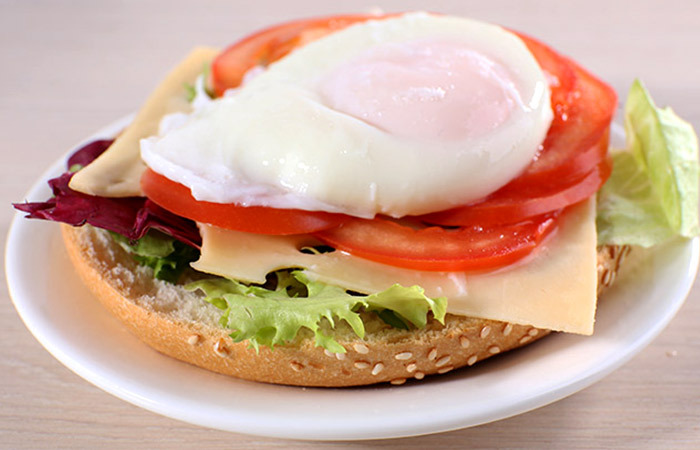 Eggs are the best source of protein and yogurt is rich in calcium and vitamin D! 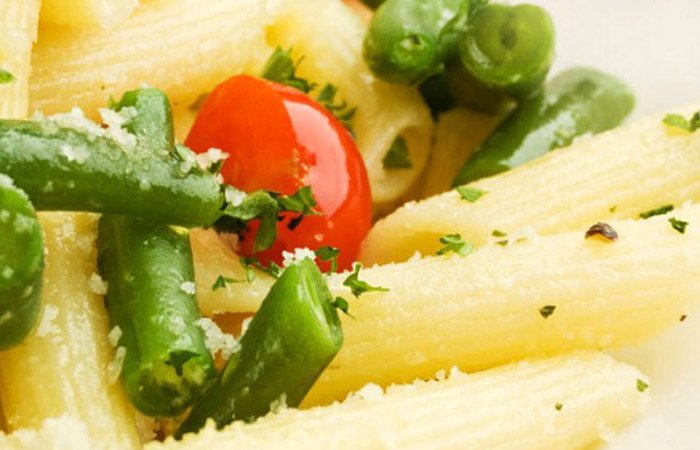 1 cup cooked whole wheat pasta tossed with 1 cup steamed string beans, ½ cup halved cherry tomatoes, 1 tablespoon grated provolone. Provolone cheese contains vitamin A and calcium. And beans are rich in fiber and iron! 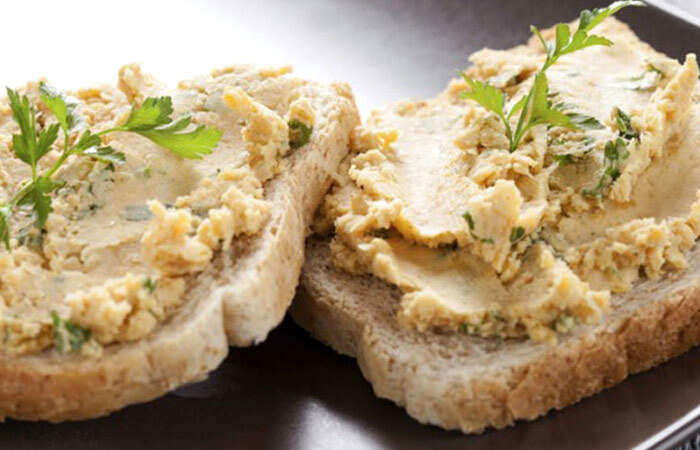 Hummus is rich in nutrients and aids in weight control. 4 red bell peppers, 1 teaspoon olive oil, ½ teaspoon salt, ½ teaspoon black pepper, 6 yellow squash, 1 large onion cut into 16 wedges, 4 minced garlic cloves. Yellow squash contains less calories and is cholesterol free! 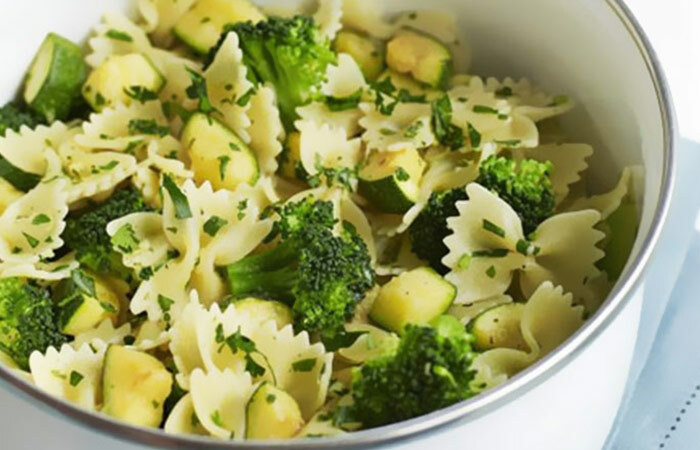 It also is a rich source of vitamin C.
2 finely grated garlic cloves, zest 2 lemons (plus a squeeze of juice), finely chopped small bunch parsley, 200 grams broccoli broken into florets, 400 grams pasta bows, 1 teaspoon olive oil, 2 chopped courgettes. Broccoli is an amazing anti-oxidant and reduces cholesterol! 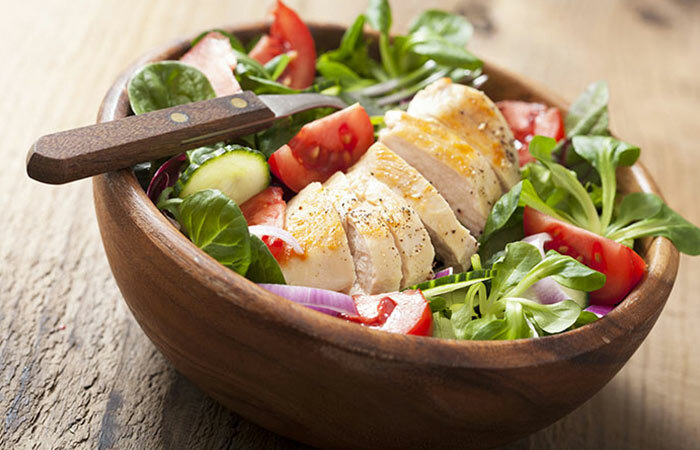 Chicken is a natural anti-depressant and contains high amounts of protein. 1 tablespoon olive oil, 5 thinly sliced garlic cloves, 2 cups thinly sliced onions, ¼ teaspoon salt, ¼ teaspoon crushed red pepper, 2 pounds coarsely chopped fresh spinach, 3 ounces crumbled feta cheese. Calcium in feta cheese helps build stronger bones. 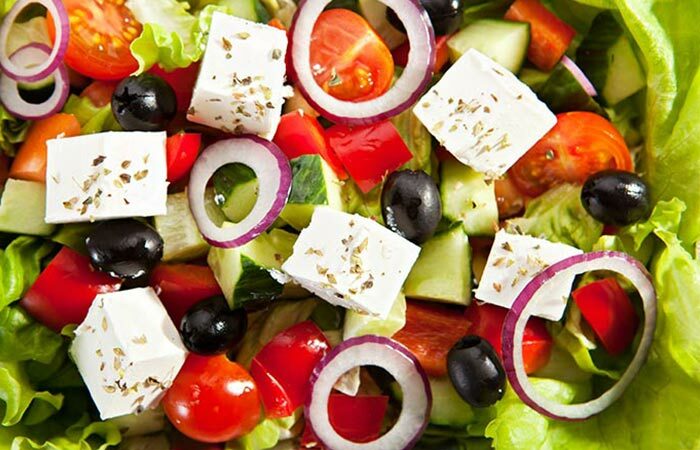 Feta cheese might also promote weight loss. Place your wrap on the plate you would like to use. Now place the 3 slices of turkey on top of each other. Spread a bit of hummus on each layer. Top it off with a handful of spinach and some goat cheese. Your meal is now ready! Turkey contains selenium in abundance, an antioxidant needed for boosting immunity and metabolism among thyroid patients (1). 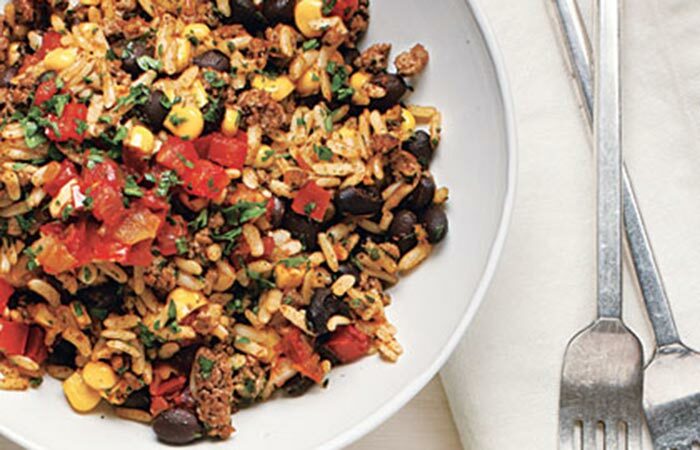 ½ cup cooked quinoa tossed with ¼ cup each black beans and thawed corn kernels, 1 diced red pepper, and chipotle chili powder for taste. 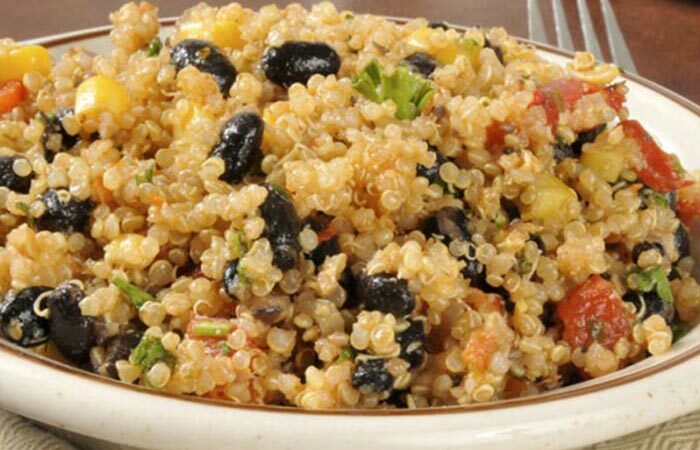 Quinoa is full of essential vitamins and promotes healthy blood sugar levels. 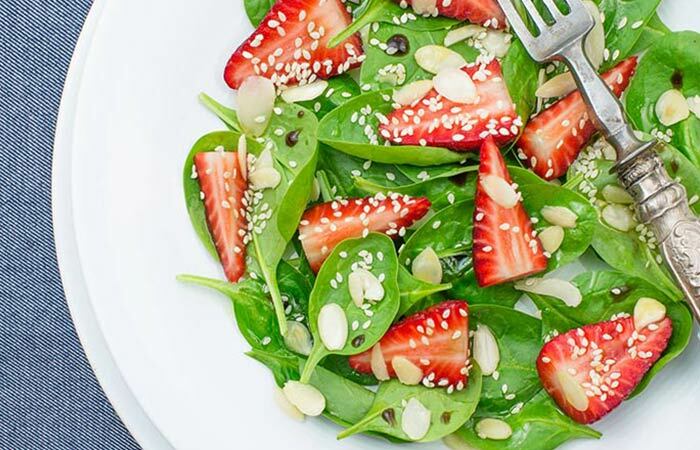 Strawberries are full of antioxidants and spinach is low in calories, and hence this recipe is something you must definitely try at home. 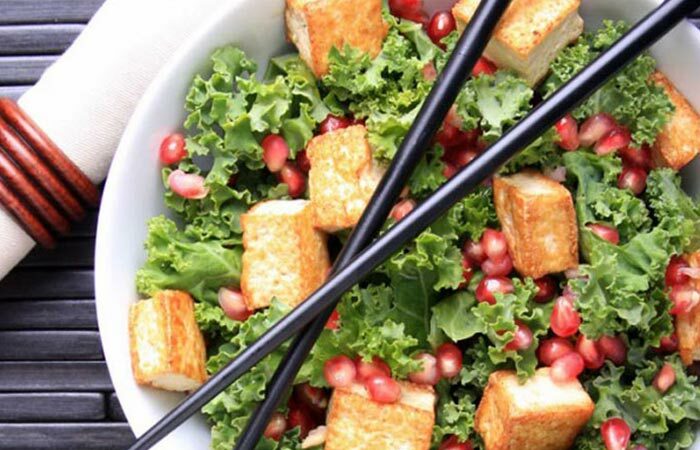 The salad contains 382 calories in total and promises to be a good treat! Preparing this salad is very simple. Get hold of a bowl and add all ingredients together. Make sure you have shredded the cheese. You could also drizzle it over the top. Olive oil, vinegar, and lime should be added right after the salad has been prepared. Strawberries can increase the good cholesterol, lower your blood pressure and protect you from cancer if your intake is regular (2). 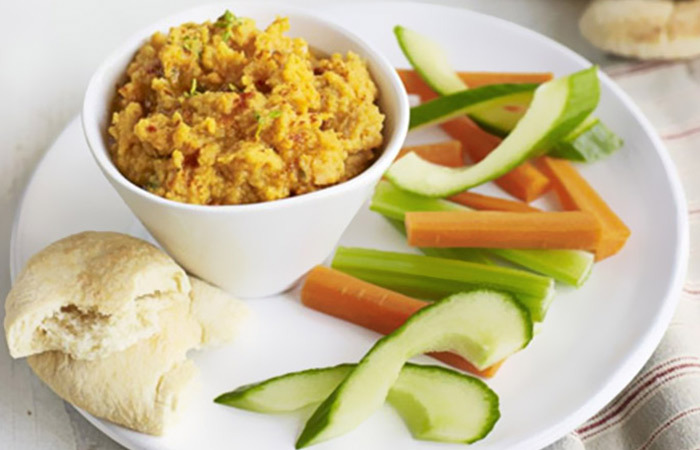 Houmous can help in weight management and it also chickpeas which can lower cholesterol. This dish contains protein and antioxidants in abundance. It contains 390 calories and will definitely make you feel full for a longer period. Heat your pan with a bit of oil and poach both the eggs first. Once that is done, place it gently on the plate you are about to use. Now boil the lentils and spread them all over the plate. Slice the avocado and place them on the sides. Do the same with the tomato slices. Eggs are rich in Vitamin B that boosts neurological development and allows your brain to function better (3). 3 ounces lean deli roast beef, 1 cup bagged coleslaw mix, 1 tablespoon horseradish in a whole-wheat wrap. Roast beef is an excellent source of iron, zinc and protein! 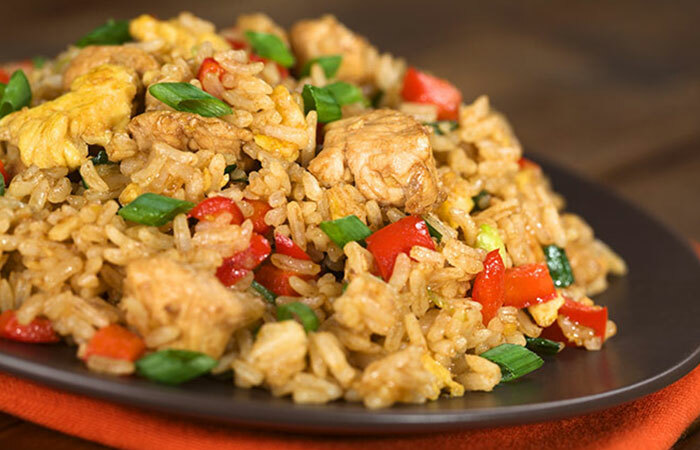 Brown rice and fried chicken would be a great idea for low-calorie lunch recipes. The meal contains only 380 calories and is full of protein and fiber. 1. Heat your pan using olive oil. Add chicken breast and onions and cook till they turn brown. Add cooked brown rice next and let it cook for a minute. Add red pepper, green pepper and mushrooms next. 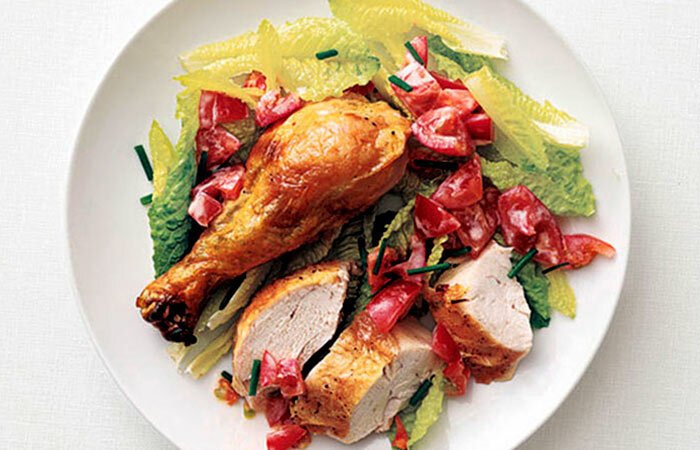 Chicken contains protein in abundance that helps in building lean and strong muscles (4). 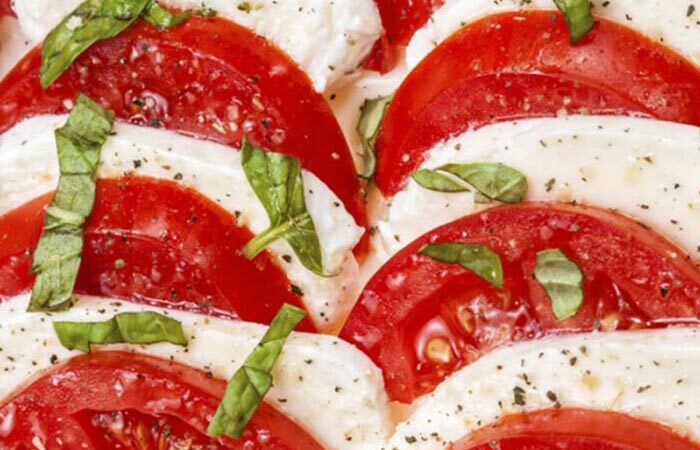 2 ounces sliced fresh mozzarella, 2 sliced beefsteak tomatoes, 2 tablespoons chopped fresh tarragon. Beefsteak tomatoes are rich in vitamins and low in calories. And tarragons are excellent sources of iron! This dish contains only 345 calories. 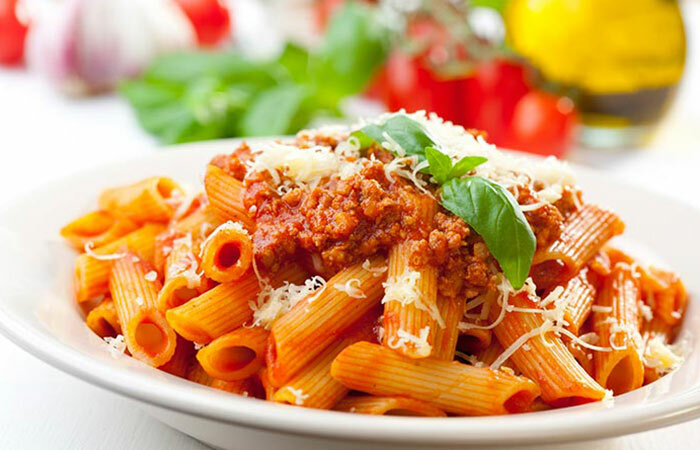 Since the dish is full of tomatoes, it will benefit your cardiovascular health and prevent cancer. Slice tomatoes and place them in a bowl. Add basil leaves and shredded mozzarella cheese. Add olive oil and balsamic vinegar as dressing. Eating tomatoes regularly can reduce the risk of pancreatic cancer (5). 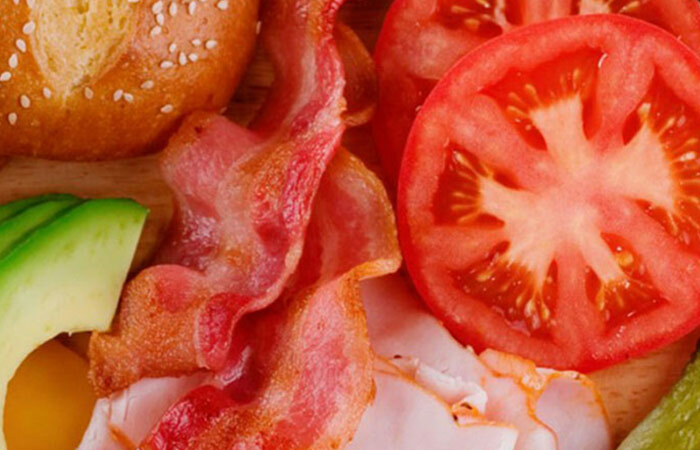 4 slices deli turkey rolled with ¼ sliced avocado, 1 slice crumbled bacon, 4 large lettuce leaves, ½ teaspoon smoked paprika. Avocados possess high fiber content. They also contain Oleic Acid, which is great for the heart. 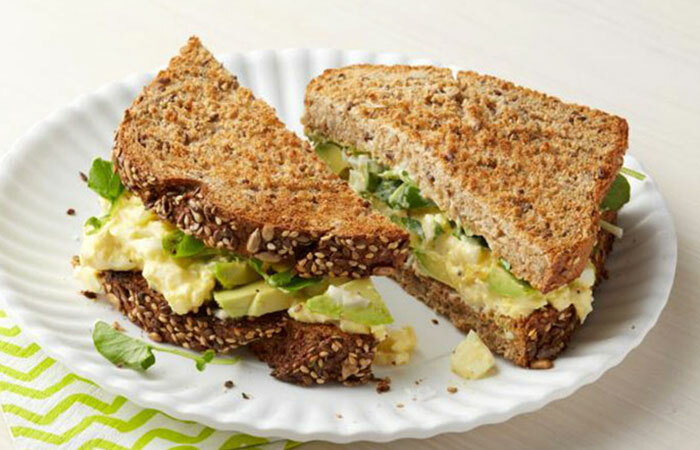 This healthy and delicious sandwich is super easy to prepare and doesn’t take much time at all. 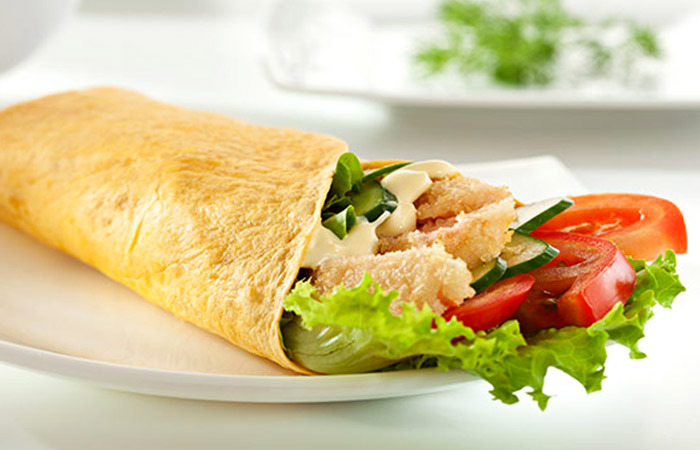 It contains 400 calories and promises to be a great combination of good health and great taste. Take both the slices of bread. Next, place chicken breast on top. Finish with 2 slices of tomatoes. Lettuce contains Vitamins E, C, potassium and folate that improve liver health and boost digestion (6). Some of us ladies love eating fast food but are often anxious about putting on weight. If you feel the same, then do try the skinny chicken sandwich. It is less than 300 calories and promises to help you manage body weight. Spread lettuce on your bread. Now place the shredded chicken on both the sides. Slice the egg into three pieces and place it on top of the chicken. Tomatoes and cucumber come next. You can use some pepper for extra taste. Cucumber contains silica in abundance which builds the strength of your connective tissues (7). 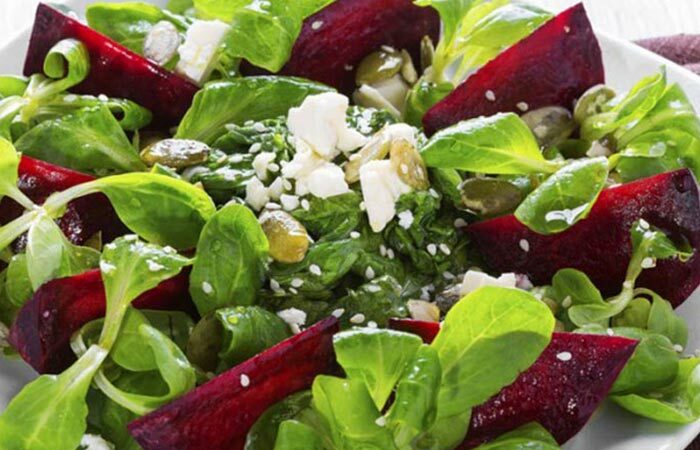 2 chopped roasted beets tossed with 2 cups of baby spinach, 1 tablespoon olive oil, 2 tablespoons crumbled goat cheese. Beets have the natural ability to cleanse the body. And goat cheese goes a great way in protecting the heart from ailments. 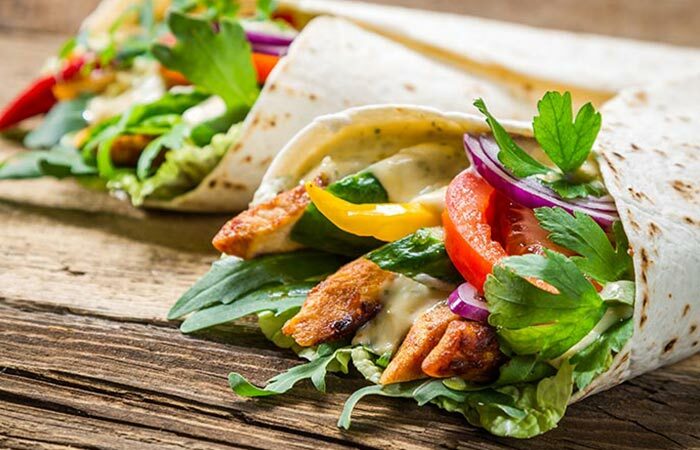 The combination of Tandoori chicken and spinach tastes absolutely delectable and is one of the best options for low-calorie lunches. If you thought healthy Indian food is boring, this will definitely change your mind. Cook the spinach first and spread it all over your plate. Place Tandoori chicken on top. Chopped onion and tomatoes should come next. 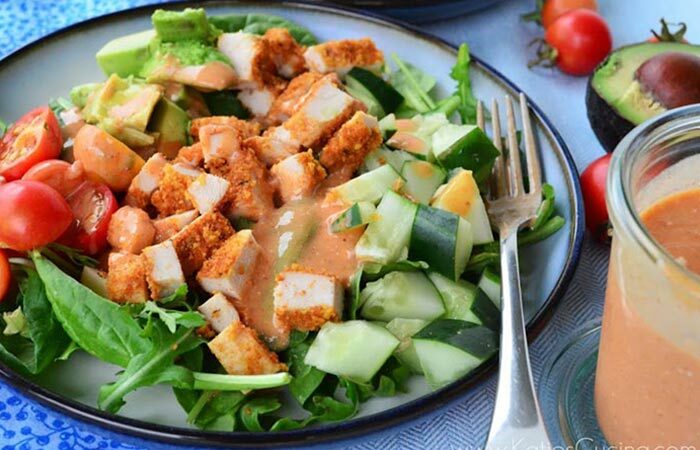 Use mozzarella cheese for dressing. Cheese contains beneficial bacteria that lowers your blood cholesterol levels, improves blood sugar and nourishes colon cells (8). 1 apple horizontally cut into 4 slices, 1 tablespoon cashew butter topped with 1 tablespoon pepitas (green pumpkin seeds). 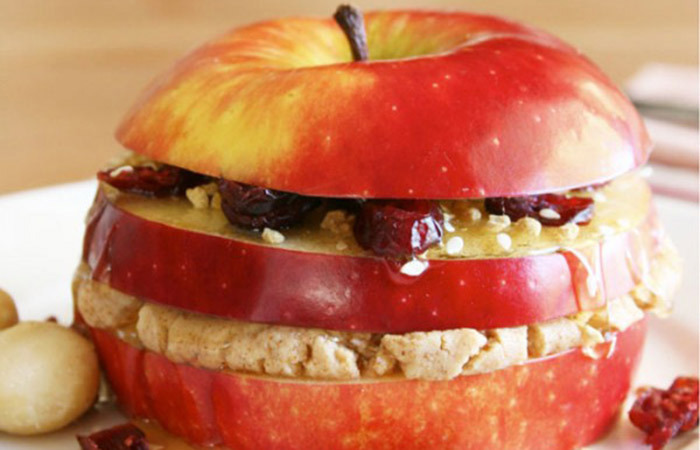 Apples are great foods that provide immunity against Alzheimer’s and Parkinson’s. 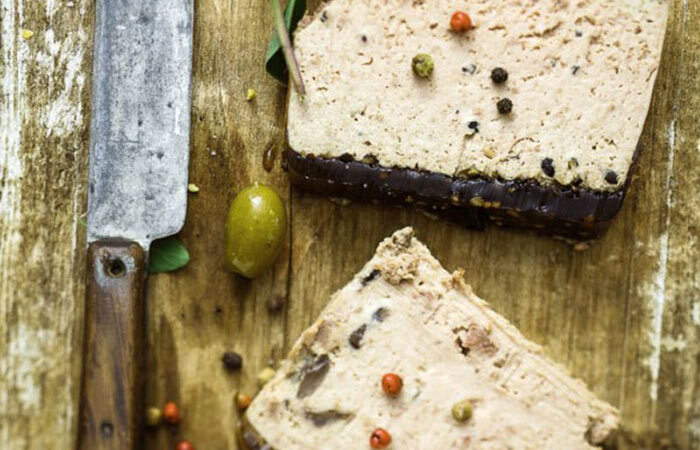 Cashew butter largely consists of Oleic Acid which is good for the heart! 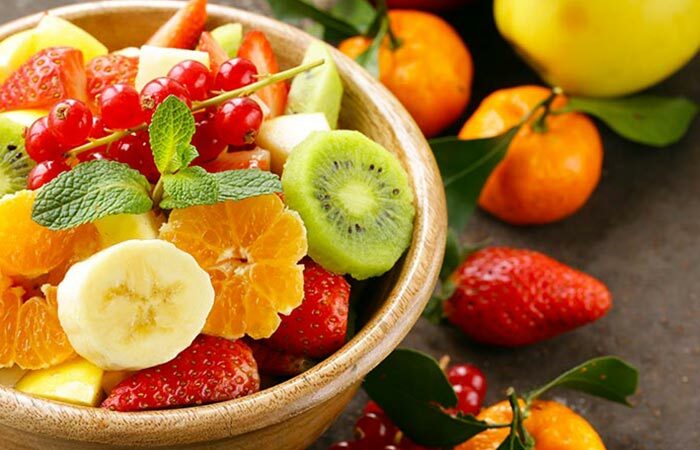 A nice cup of grilled chicken and fruit salad is super low in calories. 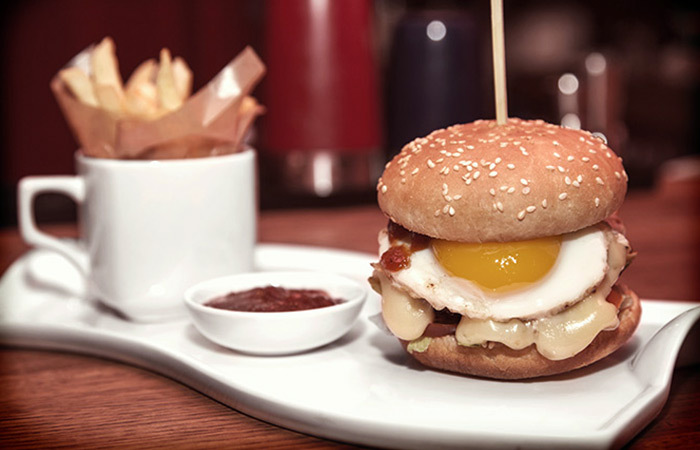 Now this is something you must have for lunch at least once. It has a lovely combination of sweetness and spices that will fill up that hungry stomach and keep you going for the rest of the day. Take a medium sized bowl and add the lettuce first. Let the fruits and veggies come next. 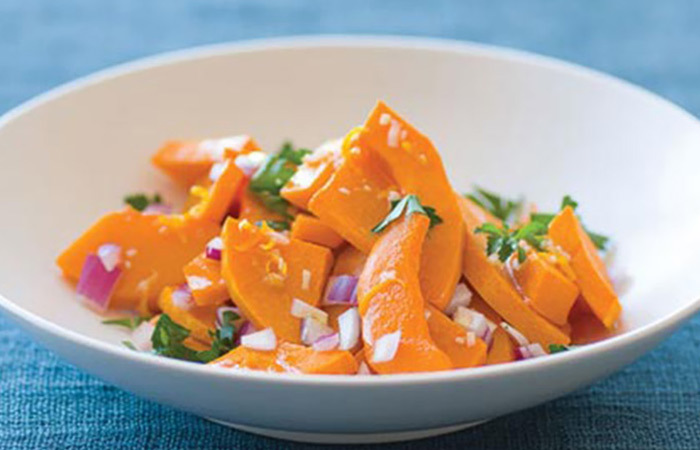 Carrots contain beta-carotene that improves eyesight and flushes out toxins (9). ¼ cup cooked lentils, 2 tablespoons walnuts, 1 tablespoon olive oil. Walnuts have cancer-fighting properties and also comprise of rare and powerful antioxidants. Black beans taste absolutely fabulous if cooked the right way! 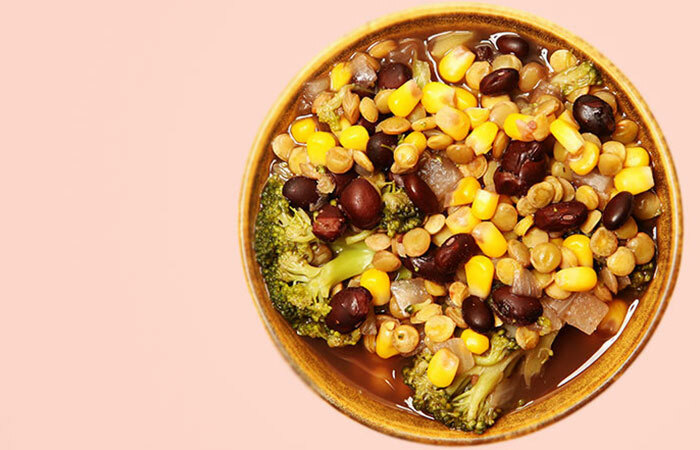 Make a soup out of black beans, and you will never leave it! 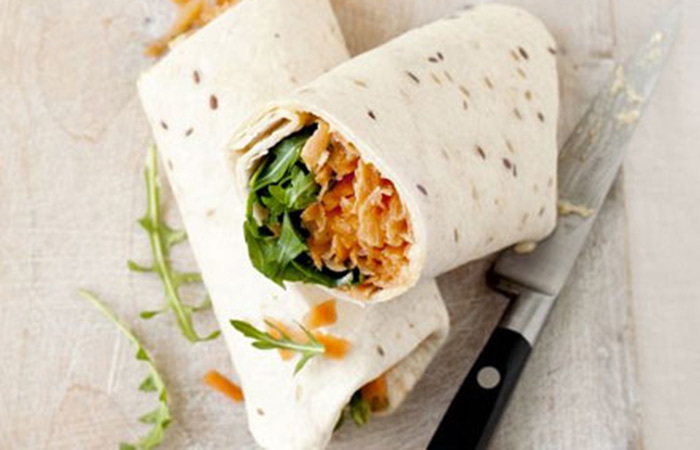 This is the wisest choice when it comes to low-calorie packed lunch. Saute the onion, cumin and garlic cloves in a heated pan with oil. Add the chicken broth, tomatoes, black beans, and green chilli. Add some fresh cilantro for dressing. Black beans can protect your cardiovascular system without letting the blood insulin levels increase (10). 4 ½ cups shredded zucchini, salt, ¾ cup self-rising flour, 2 lightly beaten large eggs, 1 cup thinly scaled scallions (light and dark parts only), ¼ cup vegetable oil. 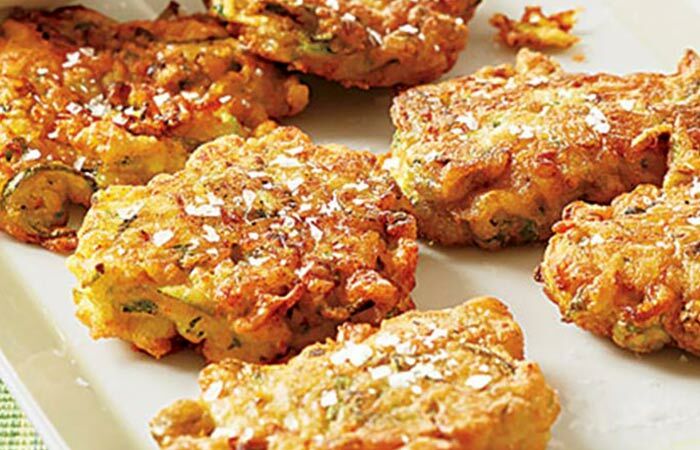 Zucchini plays a vital role in lowering cholesterol levels in the body, and is also good for the eyes. 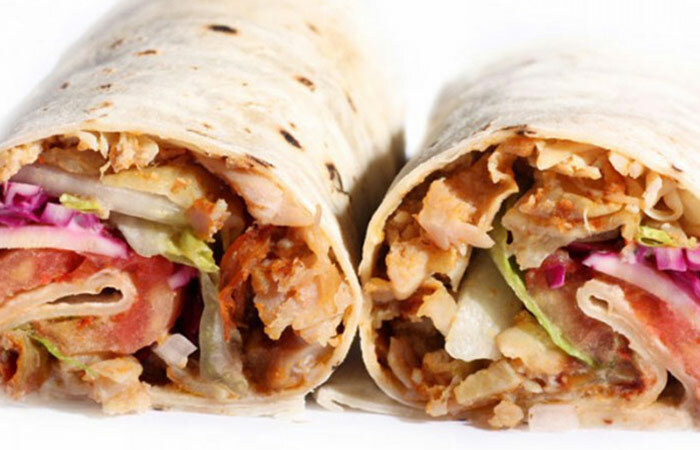 The Caesar Salmon Wrap is just scrumptious! Within just 364 calories, you can expect this healthy dish to help you manage your body weight and supply your body with wholesome goodness. Spread salmon on your pita first. Use cheese and spinach for dressing. 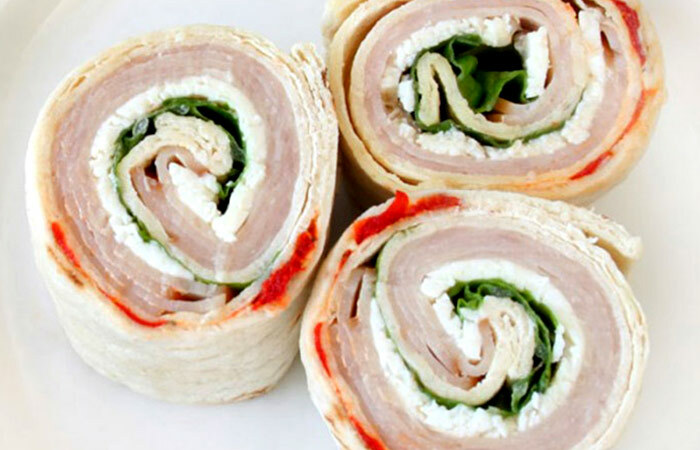 Your wrap is ready to serve. 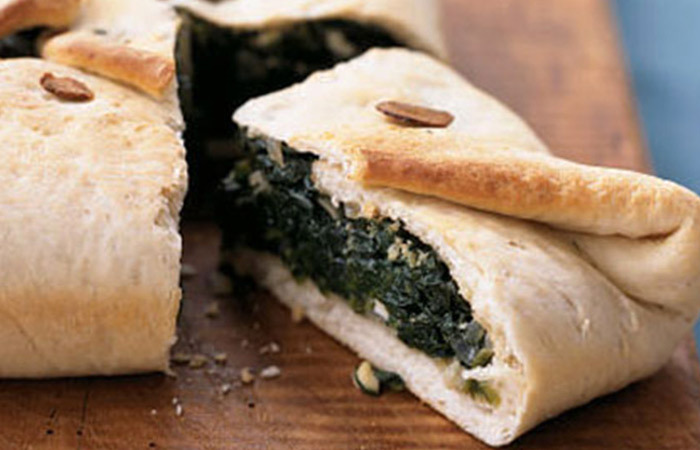 Spinach is a great source of protein, is super low in calories, and contains cholesterol lowering properties too (11). 2 tablespoons fresh lemon juice and 1 tablespoon olive oil added to 2 cups shredded kale, which is allowed to marinate overnight. Toss in ½ cup diced leftover chicken and 1 tablespoon dried currants. Kale is a great anti-oxidant and an anti-inflammatory food. It is very rich in iron and vitamins. The goodness of avocados and eggs can never be denied. It is not just healthy, but also a simple and traditional meal you can enjoy at home. Now poach yourself an egg on a heated pan. Place the tomatoes and avocado on the English muffin. 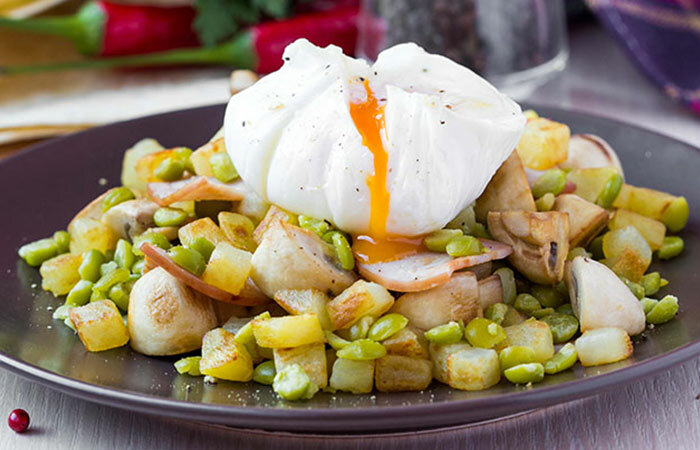 Add the poached egg on top. Avocado is full of minerals, vitamins and carbohydrates. One-fifth of an avocado contains 50 calories and around 20 vitamins and minerals (12). 1 diced and peeled butternut squash, 2 teaspoons olive oil, 50 grams wild and brown rice, 50 grams puy lentils, 1 head broccoli cut into florets, 50 grams dried cranberries, 25 grams pumpkin seeds and juice of 1 lemon. Brown rice is rich in fiber and promotes weight loss. Cranberries have anti-ageing properties. 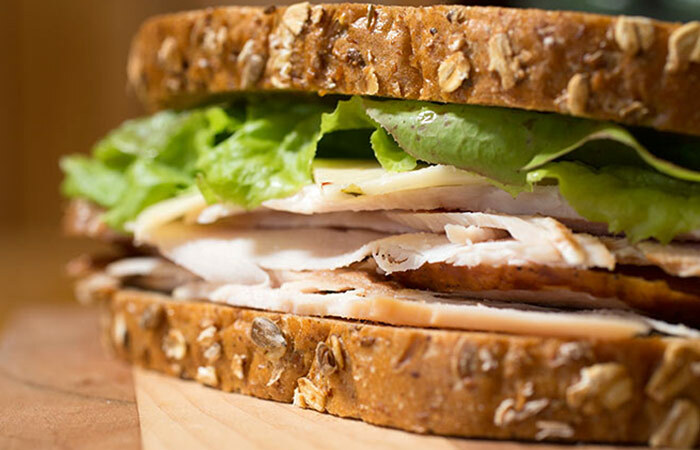 Deli ham is always lean and a perfect lunch idea for the holiday season. It contains the goodness of protein and is idyllic indeed. 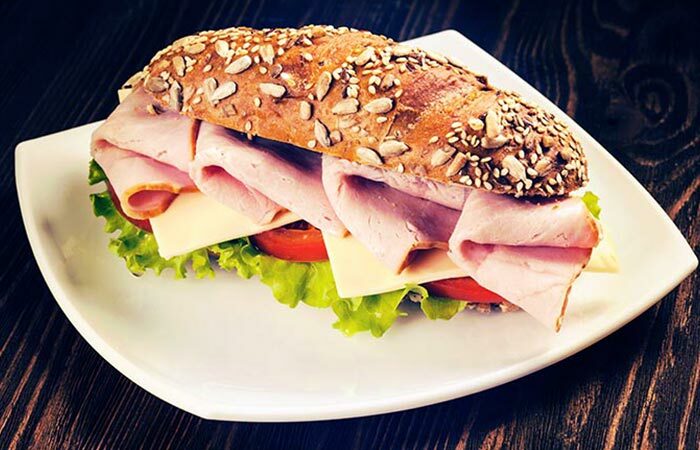 Place the slices of deli ham on a slice of whole wheat bread. Use honey mustard as dressing. Place the other slice of whole wheat bread on top of the dressing. Chop up the pear and use it as a side dish. Pear helps you lose weight and makes you less prone to diabetes (13). 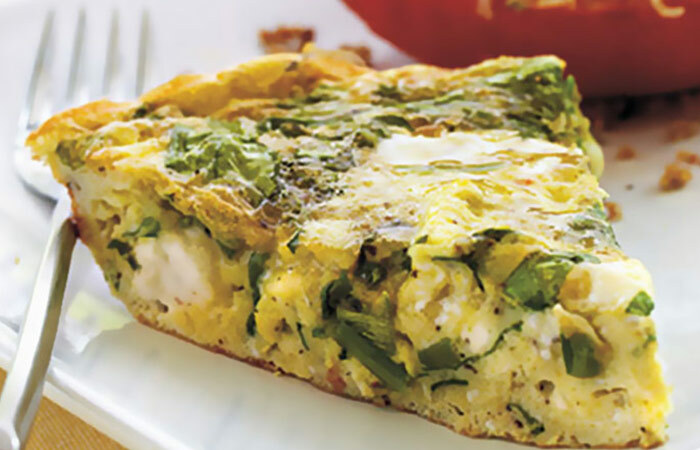 2 teaspoons olive oil, ¾ cup baked baby spinach, 2 green onions, 4 large egg whites, 6 large eggs, 1/3 cup crumbled feta cheese with sun-dried tomatoes, 2 teaspoons salt-free Greek seasoning, ¼ teaspoon salt. Green onions are rich in vitamin K and build immunity! 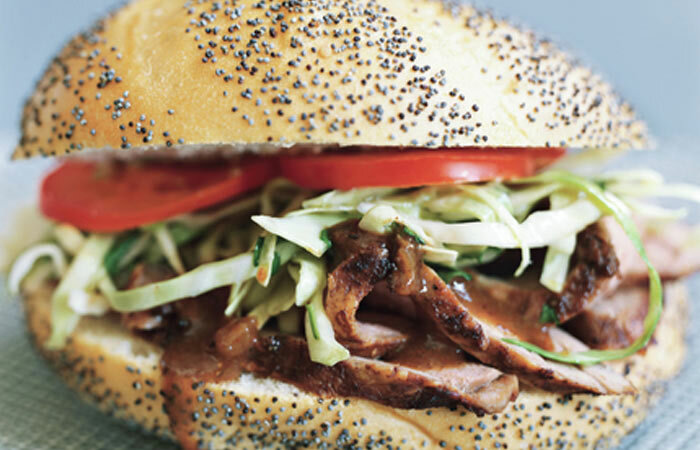 Make yourself a nice beef sandwich at home or use this to impress your co-workers at the office. Nonetheless, it is going to be a great treat for all! Place both the slices of roasted beef on top of each other on the bread. Add the slice of cheese on top of this. Use another spoon of horseradish sauce for spreading. Use lettuce as the base. The saturated fat in beef reduces chances of heart attacks and other heart-related diseases. It also lowers bad cholesterol (14). 1 ½ tablespoons balsamic vinegar, 3 tablespoons olive oil, ¼ teaspoon dried oregano, 4 small eggplants cut in half lengthwise, ½ teaspoon kosher salt, freshly ground black pepper, ½ pound deli-style thick sliced mild provolone. 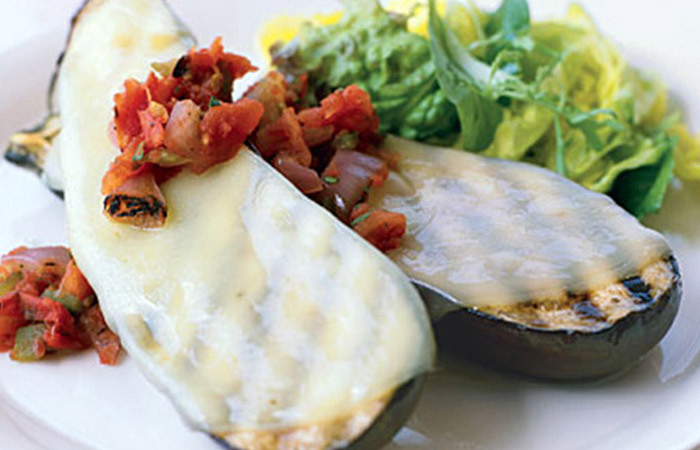 Eggplants contain essential phytonutrients which improve blood circulation. 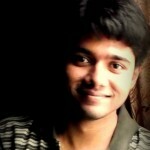 They are also known as brain foods as they help in brain nourishment. Packed with Vitamin C, the healthy combination of chicken and cornbread with some tangy citrus dressing is going to be a great meal on Saturday afternoons! 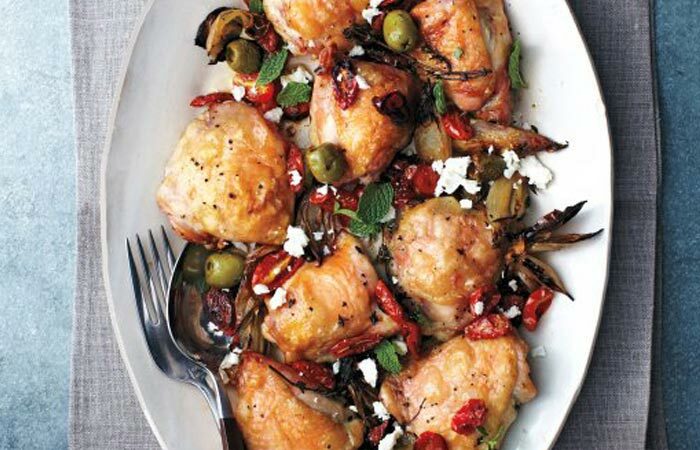 Cook the chicken with onions, tomato, and cumin on a heated pan. Add a dash of lime for taste. Corn brain contains fiber in abundance. This fiber helps you maintain healthy body weight, lower high levels of cholesterol and maintain bowel health too (15). 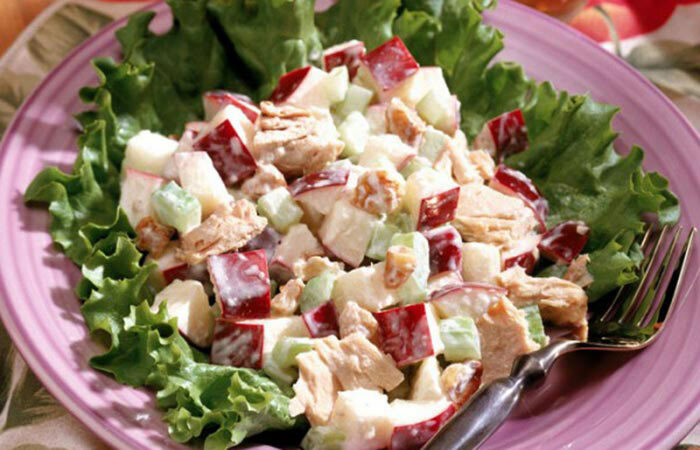 ½ cup diced chicken mixed with 2 tablespoons low-fat mayo, 1 tablespoon raw pistachios, ¼ cup pomegranate seeds over 3 cups mixed spring greens. Pistachios are rich sources of vitamin A, B and E. They increase the hemoglobin count in the blood. And pomegranate seeds aid weight management. 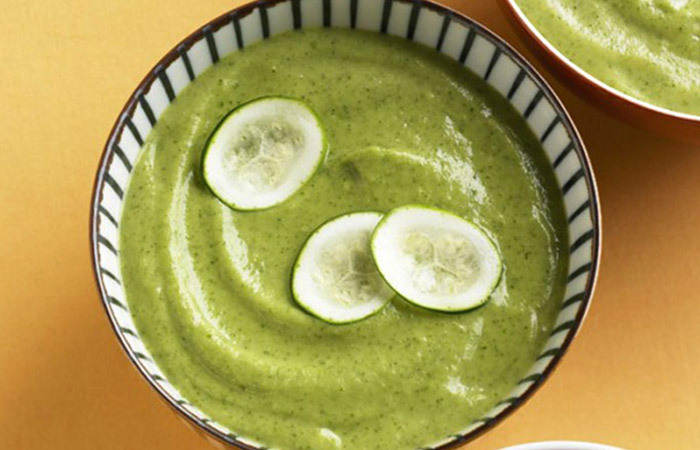 Puree ½ cucumber, 1 Avocado, and juice of 1 lime. Cucumber replenishes and rehydrates the body. Avocado aids in weight loss and prevents arthritis. 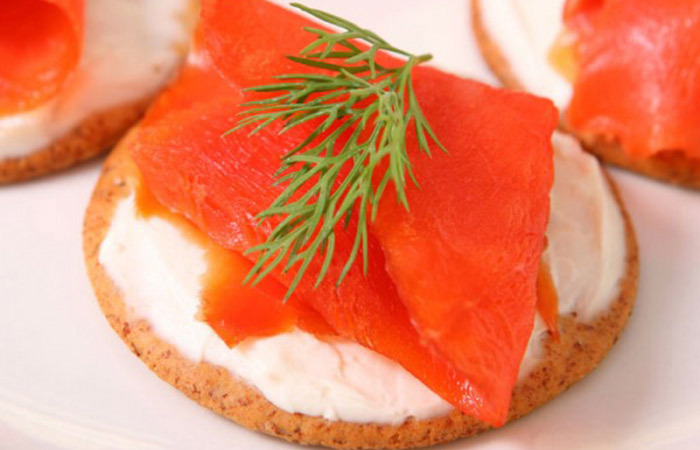 2 tablespoons vegetable cream cheese, 2 slices smoked salmon, 1 tablespoon fresh dill on bagel thins. Bagels are a good source of vitamin C, iron, protein, and fiber! 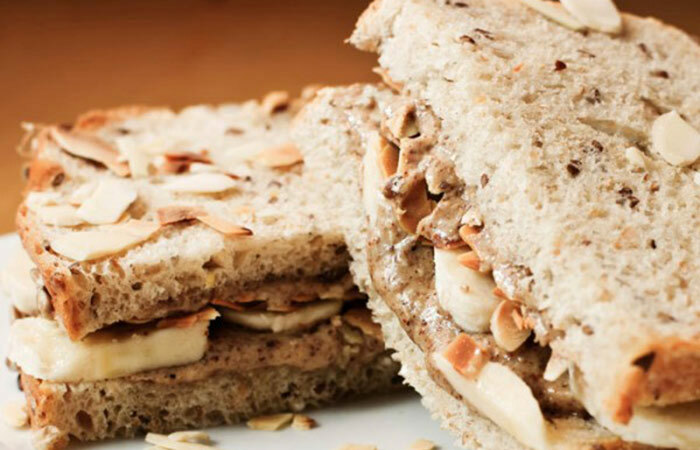 1 tablespoon almond butter and ½ sliced banana sandwich on whole-wheat cinnamon bread. Almond butter is a rich source of calcium and copper which are responsible for brain cell communication and keep the brain functional. 1 tablespoon Thai peanut sauce, 1 eight inch whole-wheat flour tortilla, 2 ounces thinly sliced seasoned baked tofu, ¼ cup sliced red bell pepper, 8 thinly sliced snow peas. Tortillas are very good source of calcium and potassium. Watercress is an amazing source of phytonutrients! 2 seven-ounce cans boneless and skinless salmon, ¼ cup minced red onion, 2 tablespoons lemon juice, 1 tablespoon extra-virgin olive oil, ¼ teaspoon freshly ground pepper, 4 tablespoons reduced-fat cream cheese, 8 slices toasted pumpernickel bread, 8 slices tomato, 2 large leaves romaine lettuce that are cut in half. Salmon is a rich source of omega 3 fatty acids! 4 cups water, 1 teaspoon extra-virgin olive oil, 5 dried porcini mushrooms, 1cup rotini, ½ pound extra-lean ground beef, 1 tablespoon finely chopped yellow onion, 1 teaspoon chilli powder, 1 teaspoon dried basil, 1 pinch of ground black pepper, 8 ounces no-salt tomato sauce, 2 tablespoons fat-free ricotta cheese. Porcini mushrooms are a good source of vitamins A, C, and fiber. 3 oz. 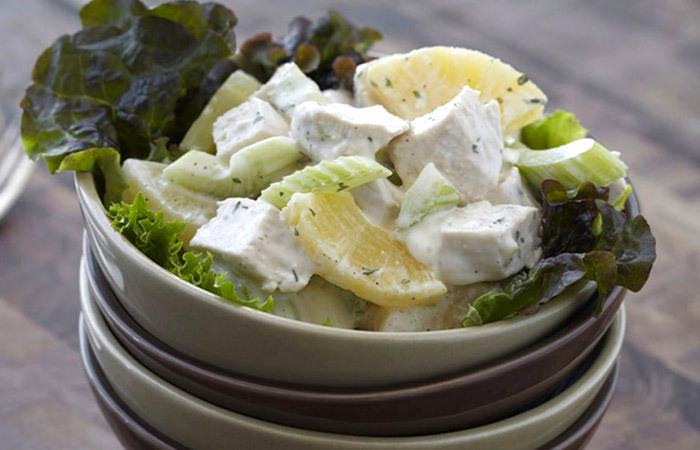 chopped and grilled chicken breast, ½ cup grapes (cut into halves), 3 tablespoons chopped walnuts, 3 tablespoons plain low-fat yogurt, salt, pepper, 3 cups romaine lettuce. Lettuce is a rich source of vitamin K and C.
¾ cup batch-cooked brown rice, ½ cup batch-cooked black beans, 1 cup batch-cooked roasted bell pepper strips, ¼ chopped avocado, 4 tablespoons batch-cooked homemade salsa. Black beans are known to regulate blood sugar levels and help prevent cancer. 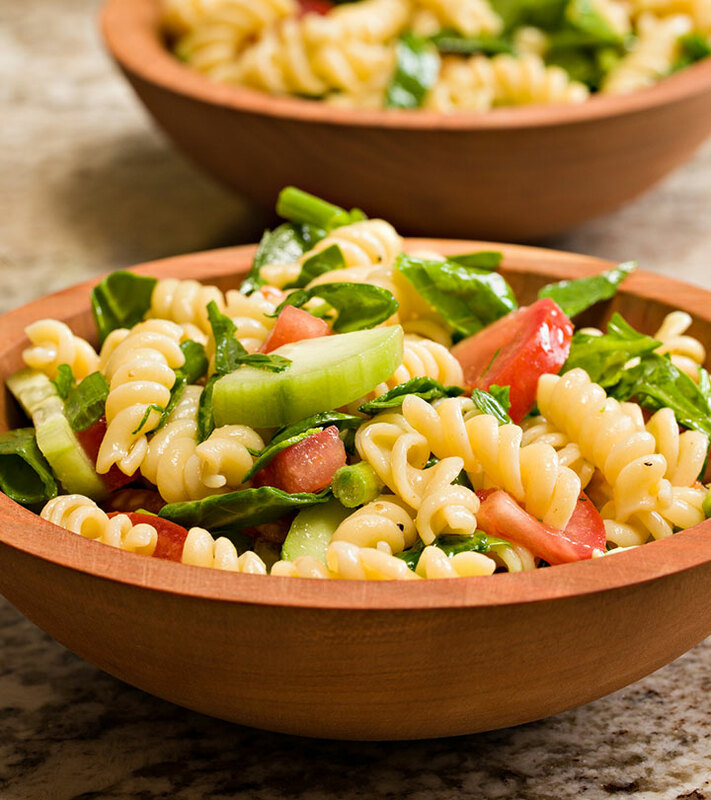 3 tablespoons grated parmesan cheese, 2 tablespoons lemon juice, 2 tablespoons Dijon mustard, 2 tablespoons olive oil, salt and pepper for taste, 1 batch-cooked hard-boiled egg, 3 cups romaine lettuce, ½ cup chopped tomatoes, ½ cup chopped cucumber, 4 whole-grain crackers. Parmesan cheese, in addition to its rich protein and calcium presence, is also a rich source of sodium. Chicken breast, apart from its deliciousness, is known for its lean protein content. 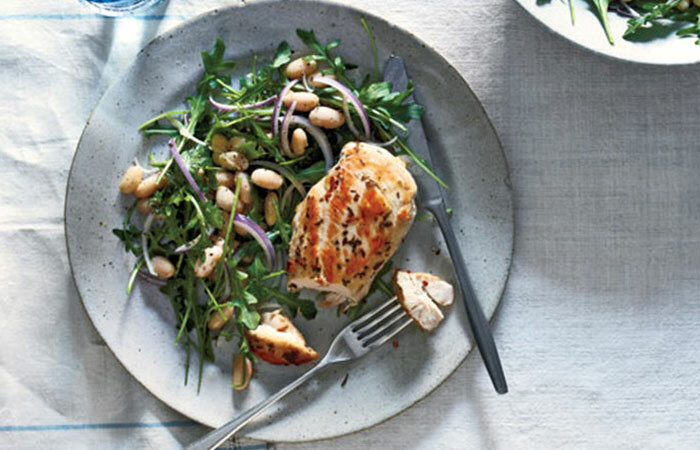 2 tablespoons red wine vinegar, 2 tablespoons chopped fresh rosemary, 2 cloves chopped garlic, 5 tablespoons olive oil, kosher salt and black pepper, 4 six-ounce boneless and skinless chicken breasts, 2 teaspoons Dijon mustard, 1 15.5-ounce can cannellini beans, 4 cups baby arugula (about 3 ounces), 1/4 small thinly sliced red onion. Very easy to prepare. And the Chicken is juicy and delicious. 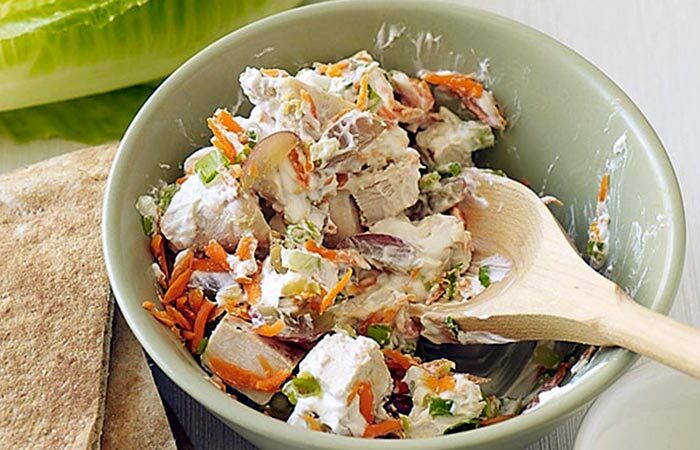 ¼ cup buttermilk, ¼ cup mayonnaise, 1 tablespoon fresh lemon juice, 4 roughly chopped plum tomatoes, kosher salt and black pepper, 2 romaine hearts (torn into bite-size pieces), 1 2- to 2 ½-pound rotisserie chicken (cut up), 1/2 tablespoon chopped fresh chives. Plum tomatoes contain anti-oxidants which help fight free radicals. 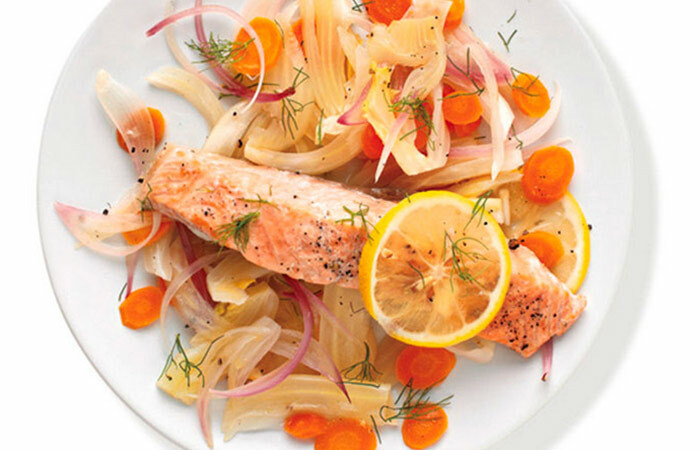 1 sliced bulb fennel, 2 sliced carrots, 1 sliced shallot, ¼ cup dry white wine, 4 six-ounce salmon fillets, kosher salt and black pepper, 1 sliced lemon. In addition to containing omega 3 fatty acids in salmon, the dish also has good amounts of calcium and sodium. 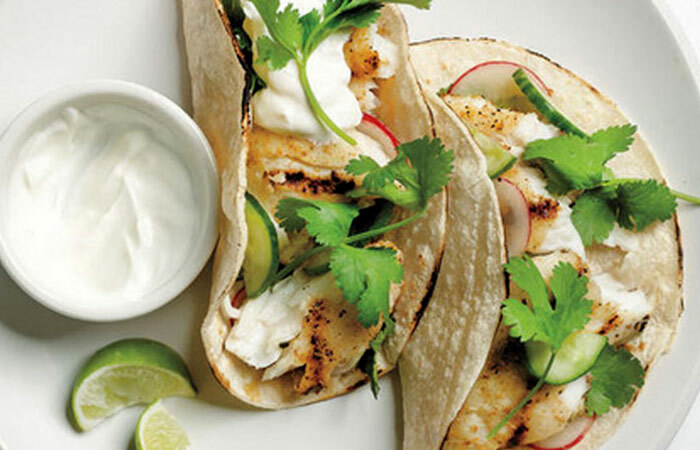 1 tablespoon olive oil (plus more for the grill), 4 six-ounce tilapia fillets, 1 teaspoon ground coriander, kosher salt and black pepper, 6 sliced radishes, 1 halved and sliced cucumber, 2 tablespoons fresh lime juice, 8 warmed corn tortillas, 1 cup fresh cilantro leaves, ¼ cup sour cream. The fish tastes awesome with a squeeze of lime on it. 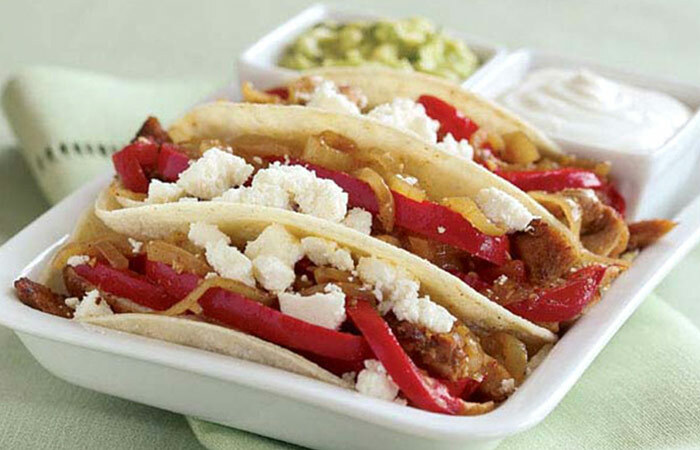 2 tablespoons of olive oil; 8 ounces chicken cutlets, cut into 2-inch strips; 1 teaspoon ground cumin; kosher salt and black pepper; 2 cloves garlic, chopped; 1 medium onion, sliced; 2 bell peppers, sliced; 8 6-inch flour tortillas, warmed. The bell peppers add to the tasty merry! 1 tablespoon olive oil; 1 14-ounce package extra-firm tofu, drained, patted dry, and crumbled; 1 1/2 teaspoons chili powder; kosher salt and black pepper; 1 10-ounce package frozen corn (2 cups), thawed; 1 5-ounce package baby spinach (about 6 loosely packed cups); 8 small flour tortillas, warmed; 3/4 cup crumbled fresh goat cheese (3 ounces); 3/4 cup store-bought refrigerated salsa. The dish is easy, flavourful and healthy. And having it with wheat tortillas will only make it even amazing! 1 cup long-grain rice; 2 tablespoons olive oil; 1 pound boneless, skinless chicken breasts, cut into 2 1/2-inch pieces; kosher salt and black pepper; 1 large onion, thinly sliced; 1 pint grape or cherry tomatoes, halved; 1 cup large pimiento-stuffed olives, quartered; 2 cloves garlic, thinly sliced; 3/4 cup dry white wine; 3/4 cup fresh flat-leaf parsley, chopped. Fresh leaf parsley gives you a taste you can’t forget! 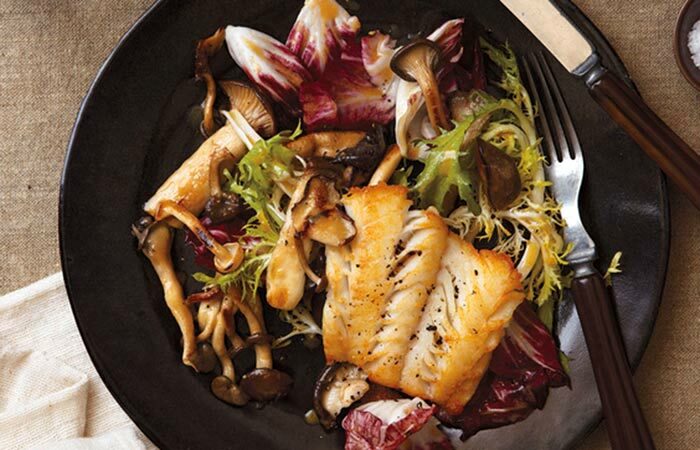 5 tablespoons olive oil; 3/4 pound mixed mushrooms (such as button, cremini, and shiitake), stems trimmed and cut into bite-size pieces; kosher salt and black pepper; 1/4 cup apple cider vinegar; 2 teaspoons Dijon mustard; pinch sugar; 1 small head frisée, leaves torn (about 4 cups); 1/2 head radicchio, leaves torn (about 2 cups); 4 6-ounce pieces skinless haddock, cod, or striped bass fillet. Mushrooms increase vitamin D levels throughout your diet! They also enhance your immune system and improve the nutritional intake. 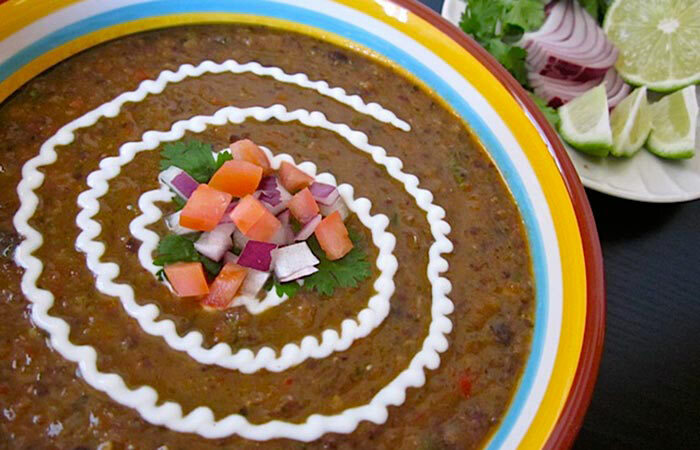 2 tablespoons plus 2 teaspoons olive oil; 1 large poblano or green bell pepper, chopped; 2 cloves garlic, chopped; 1 large red onion, chopped; kosher salt and black pepper; 1 teaspoon ground cumin; 2 15.5-ounce cans black beans, rinsed, or 1 heaping cup dried black beans, soaked and cooked; 1 12-ounce bottle lager beer; 3 to 4 jalapeños, halved and seeded; 1/2 cup fresh cilantro leaves; 2 tablespoons fresh lime juice. The garlic in the soup is good for the heart. It boosts immunity as well. 1/3 small head of cabbage, thinly sliced (about 1 1/2 cups); 1 cup packed fresh cilantro leaves; 3 tablespoons red wine vinegar; 2 tablespoons olive oil; 1 teaspoon sugar; 1/2 teaspoon kosher salt; freshly ground black pepper; frozen Chili Sauce, thawed; 2 frozen pork tenderloins, thawed and sliced; 8 sandwich rolls; 5 small tomatoes or plum tomatoes, thinly sliced. The protein in pork tenderloin can be used to maintain strong tissues. 4 6-inch corn tortillas; 1/2 cup grated Monterey Jack cheese; 3 hard-boiled eggs; 1/4 cup salsa. 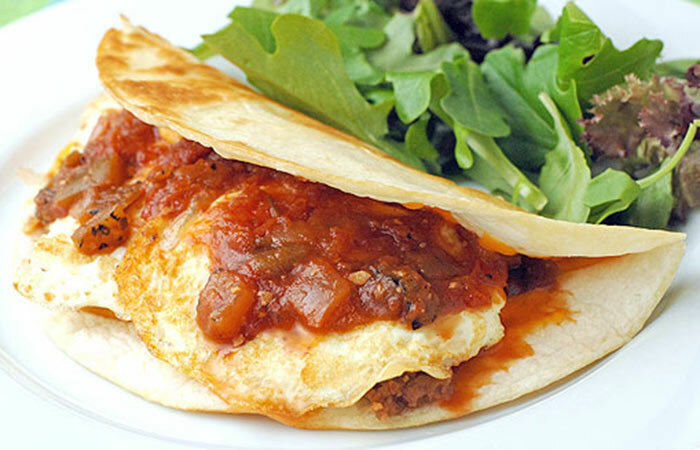 High fiber content of the corn tortillas and proteins in eggs make this dish a healthy choice. 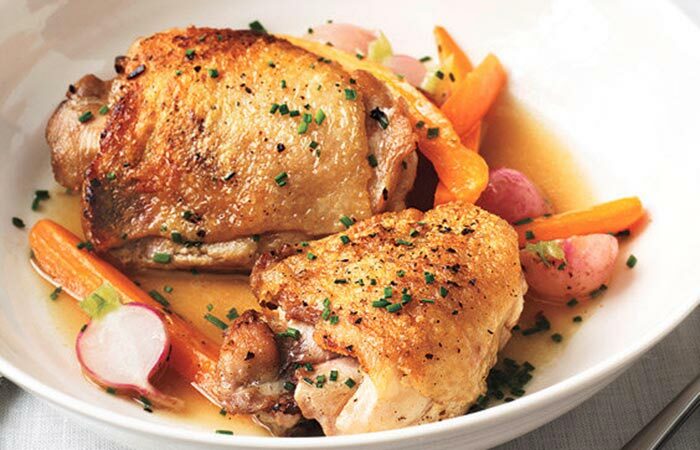 1 tablespoon olive oil; 8 small bone-in chicken thighs (about 2 1⁄2 pounds); kosher salt and black pepper 1 cup low-sodium chicken broth; 12 medium radishes, halved; 3/4 pound carrots (about 4), cut into sticks; 1 teaspoon sugar; 2 tablespoons chopped fresh chives. Springing vegetables into the main dish makes the entire meal healthier and balanced. 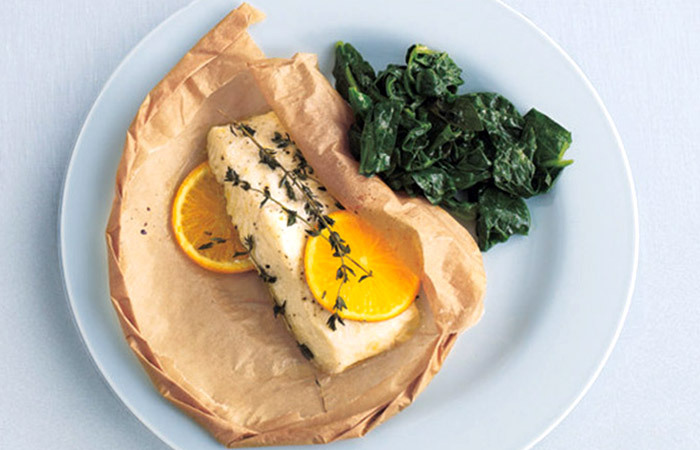 4 6-ounce pieces skinless halibut fillet; kosher salt and black pepper; 12 sprigs fresh thyme; 1 small orange, thinly sliced; 2 tablespoons olive oil; 1 10-ounce package spinach, thick stems removed (about 16 cups); 2 cups fresh basil leaves. Helpings of spinach are rich in iron and help build metabolism and immunity. 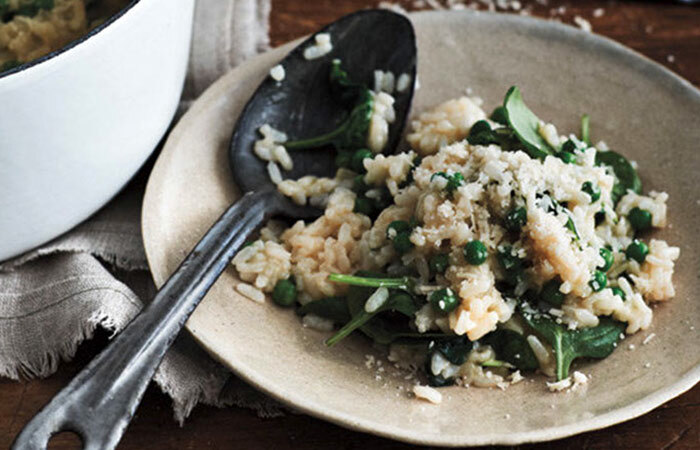 2 tablespoons unsalted butter; 1 shallot, chopped; kosher salt and black pepper; 1/2 cup dry white wine; 3 cups low-sodium vegetable or chicken broth; 1 cup Arborio rice; 1 cup frozen peas; 4 ounces flat-leaf spinach, roughly chopped (about 2 cups); 1/4 cup grated Parmesan (1 ounce), plus more for serving. 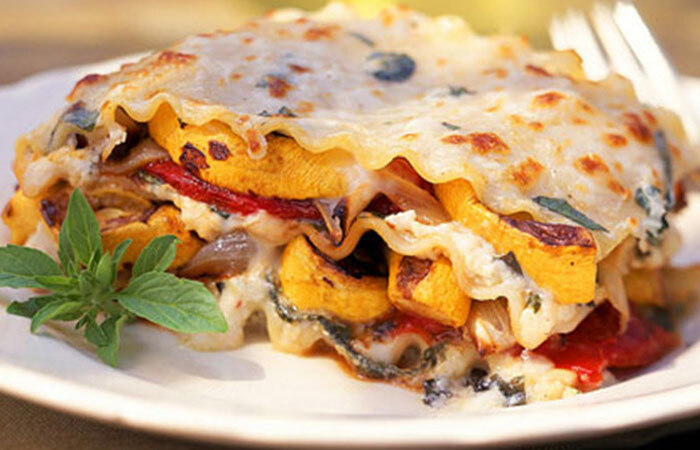 This dish is so easy to prepare that you don’t have to wait any longer to gobble it down! 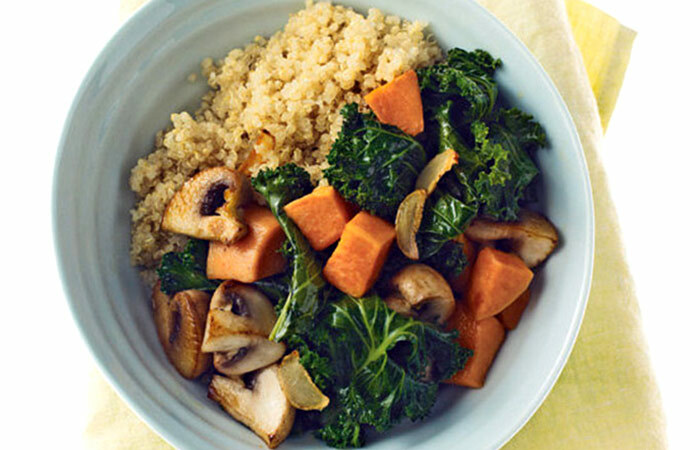 1 cup quinoa; 2 tablespoons olive oil; 2 small sweet potatoes (about 1 pound), peeled and cut into 3/4-inch pieces; 10 ounces button mushrooms, quartered; 2 cloves garlic, thinly sliced; 1 bunch kale, stems discarded and leaves torn into 2-inch pieces; 3/4 cup dry white wine; kosher salt and black pepper; 1/4 cup grated Parmesan (1 ounce). 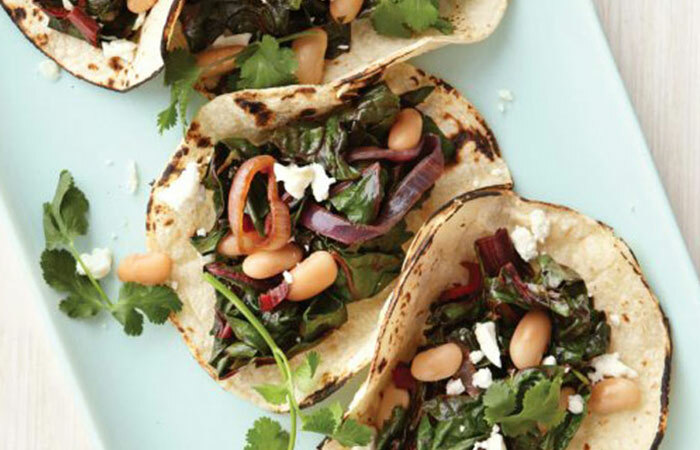 One of the most innovative ways of using kale, this dish takes ‘healthy’ to another level. 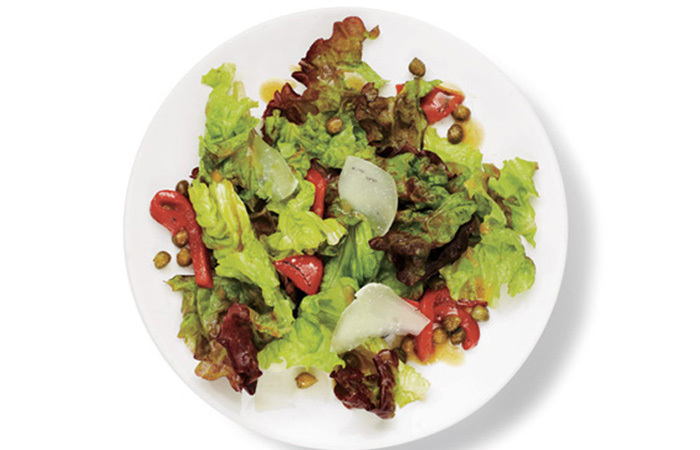 3 tablespoons olive oil; 1 1/2 tablespoons red wine vinegar; 1/2 teaspoon Dijon mustard; 1/2 teaspoon honey; kosher salt and black pepper; 1 small head red leaf lettuce, leaves torn (6 cups); 1/2 cup store-bought roasted red peppers, sliced; 2 tablespoons capers; 2 ounces pecorino, shaved. The salty capers and shaved pecorino give this salad all the boost it needs. So what is it that you are waiting for? 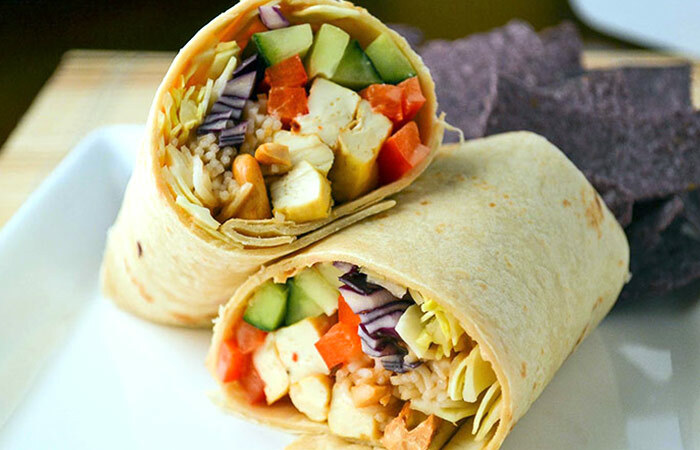 Just grab a plate of these low calories lunches and have a healthy day!